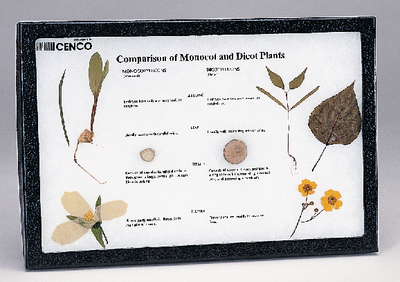 These mounted specimens are a fine supplement to textbook illustrations. These actual mounted specimens will be a fine supplement to textbook illustrations. This comparison clearly exhibits the difference between monocot and dicot flowering plants by comparing seedlings, leaves, stems, and flowers. It includes eight specimens.